Today in maths we were using water to help us figure out ‘missing number’ questions. 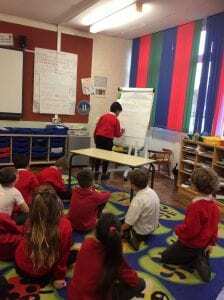 In two teams, children used different methods before coming back into class and sharing either the water measuring method or the written inverse method. We then discussed which one is easier to use and which one they preferred. Unsurprisingly, the new water method was by far the favourite!